A great blend of quality and value on this no-frills Weissenborn-style lap guitar. Quality, cost-conscious build. Superb for bluesier slide playing. Includes hard case. Pickup adds £229 to the base price. We'd better start with some brief history. Hermann Weissenborn was a German ex-pat who relocated to the US around the start of the 20th century. Working for various companies and then under his own name, he built guitars in Los Angeles, notably in the 1910s and 20s, when the kind of guitar you see on these pages was conceived. Following the trend for Hawaiian music, early Weissenborns were typically made from koa, with either solid or hollow square necks, designed to be played lap-style. Despite the modern fascination with the instruments, Weissenborn's original business struggled badly, as Hawaiian music declined in popularity during the 1930s. Since then, the Weissenborn name has become a generic term of sorts, describing a style of instrument rather than a brand. "Ed Greenfield's quest for a quality, reasonably priced Weissenborn-style instrument led him to build his own"
That said, in the US and UK, the Weissenborn trademark is owned by Breezy Ridge Instruments Ltd, started by British musician John Pearce (of John Pearce strings fame) and his then wife Mary Faith in 1980. This guitar comes from a Dorset-based firm, headed up by one Ed Greenfield. A former fishing boat builder, Ed's own quest for a good quality, reasonably priced Weissenborn-style instrument lead him to the conclusion that he had no real choice but to build his own. The Style 1 was Weissenborn's most plain and simple instrument. Typically made of koa, this one is in fact crafted from solid mahogany throughout in an attempt to keep the guitar at a very reasonable price (there's also a Style 4 Koa version at £899). 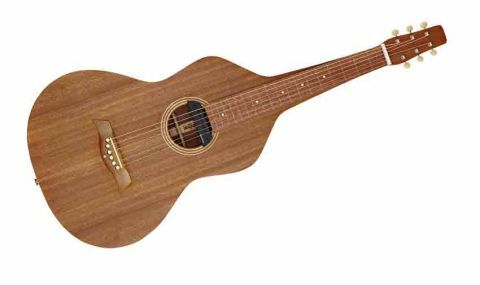 Where the Weissenborn differs radically from other acoustic instruments, including Dobro-style lap guitars, is that the body's sides are one with the square neck, extending all the way up to the nut. The neck is hollow, creating a bigger and more complex soundbox than a conventional acoustic, which is obviously a significant contributor to the distinctive tone. The top and back are also solid mahogany; in both cases two pieces, joined down the centre that cover the whole area from the lower bout all the way up to the solid anchor that is the headstock. All that's left is to stick the mahogany fingerboard to the front and put the bridge in the right place. Despite the ostensible simplicity, however, it's nonetheless a very elegant instrument; minimal three-ring maple soundhole inlays, no binding, no rope decoration and just five simple dots on the 'board. Being a vintage- inspired model, tuners are open-geared Waverley with ivoroid buttons: they look rudimentary but are extremely good quality. Anderwood offers guitars in either gloss or matte finish, this one is the latter that's very much in tune with the current trend of all-mahogany, simple instruments such as Martin's tremendously successful 15-Series. A lap steel is obviously a very different proposition, but we think they'll nonetheless appeal to similar groups of players. "A strum across the strings elicits a thick, full, highly resonant tonality"
Just in case you're wondering, no you can't play it 'normally'. The back of the neck is square and the strings are three-quarters of an inch off the fretboard. Armed with a tonebar, then, a strum across the strings in open D major (that's an open E chord, down a tone) elicits a thick, full, highly resonant tonality that suggests the whole thing is working as one, just as it should. You might be aware of the extra overtones and 'fullness' you get out of a great 12-fret acoustic guitar compared with an equivalent 14-fretter; this has elements of that, but a few steps on again. It's not highly refined; for example one of the last Weissenborn-style instruments we played (and heard played) was Martin Simpson's all-koa, gloss-finished guitar made by Ralph Bown. That thing sings like angels on autotune in HD, but as a result also requires immense skill and control to get the best from it. By contrast, this is much more friendly and, dare we say, more 'bluesy'-sounding with its slightly subdued trebles and less piano-like projection. Don't take that as a criticism, it's merely a comparison and we know players who will prefer the less crystalline, perhaps less 3D tonality. With a couple of condenser mics over the top and goodly dollop of reverb for recording, you soon get lost in the sheer depth and beauty of what's coming out for all manner of roots-derived styles... assuming you're reasonably adept with a tonebar of course! The included Seymour Duncan Mag Mic pickup offers a decent presentation of the sound through an amp or PA, that will appeal to anyone who recoils from the 'standard' piezo harshness of undersaddle pickups. The predominant signal is the magnetic part of the pickup that has a very organic midrange quality, something that piezos really lack. Mixing in the internal mic gives a more realistic presentation for high frequencies especially, but go easy because feedback soon becomes a problem. One great thing about the magnetic pickup is that you can add overdrive and go all Ben Harper: what a completely wonderful, engulfing, indulgent sound. Where would you use it? Anywhere! Blues, country, pop, alt-rock, Americana, folk - you hear sliding acoustic pretty much everywhere these days. Hats off to Anderwood for offering a quality, cost-conscious route into Weissenborn-style guitars. Dealing direct through its own website keeps prices realistic and, according to Ed Greenfield, also enables him to provide better, more direct customer service than a big retailer who might have bigger, more lucrative sales to make. The Style 1 M is the highest quality 'simple' instrument in Anderwood's range, with options either way if you want flashier looks, gloss finishes or koa wood. Adding the Duncan pickup contributes significantly to the cost, though bear in mind that it comes fully fitted, itself a fairly complex process. At this price - including a hard case - the Style 1M is extremely hard to fault. Can we have a gloss koa one now, please?